Mahesh Babu is extremely happy today, after all, his wax statue has been unveiled in his hometown, Hyderabad, India. The actor took to his social media handle to thank Madame Tussauds Singapore team for the wonderful artistry and detailing. He has also thanked them for unveiling the wax figure amidst his family, friends and fans. Mahesh Babu is the first Tollywood star of Madame Tussauds Singapore. 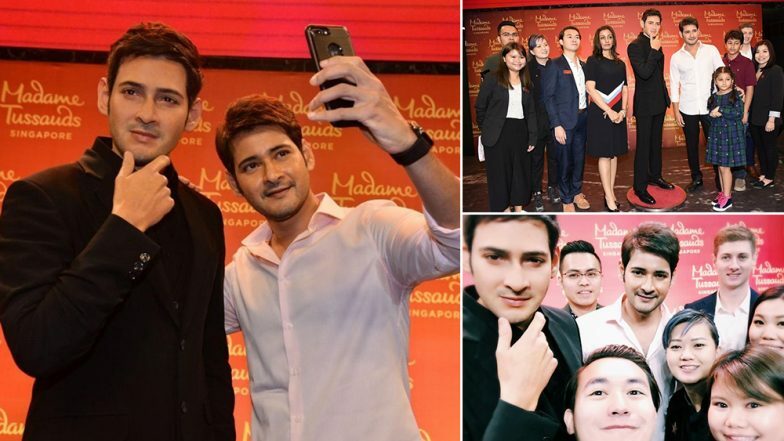 Telugu Superstar Mahesh Babu’s Wax Statue Unveiled in Hyderabad, Sudheer Babu’s Message for Brother-in-Law Is a Must Read – See Pics. As soon as the wax figure of Mahesh Babu was unveiled, family, industry friends and fans of the actor started sharing their excitement to see the wax idol. The actor’s wife Namrata Shirodkar and children were also part of the event and pictures of the same took the internet by storm. Mahesh who is extremely happy shared pictures on Instagram and wrote, “My first reaction was... Wow!!! Quite freaky in a way looking at another Me!! Can't get more real than this... Hats off to the artistry & detailing by the @mtssingapore team. It's unbelievably close to life. Thanks a lot to Madame Tussauds SG team for unveiling the figure in my own city & my country amidst my family, friends & fans. Extremely happy with the response & love, each one has showered on me. I'm very happy, overwhelmed and grateful.” Mahesh Babu Spends Time With His Little Fan Suffering From Cancer and Wins His Fans' Hearts Again-See Pics. Soon Mahesh Babu’s wax figure will join the rest of the stars at Madame Tussauds Singapore. On the work front, the actor will be seen in the upcoming film Maharshi in which Pooja Hegde is paired opposite him. The film is scheduled to release on May 9. Stay tuned for further updates.